Apatela radians Westwood, 1848, Cabinet of Oriental Entomology,. Apsarasa figurata Moore, 1877, Proc. zool. Soc. Lond., 1877: 604, syn. n.
Apsarasa nigrotarsata Grunberg, 1911: 163, syn. n.
Apsarasa dajakana Grunberg, 1911: 163, syn. 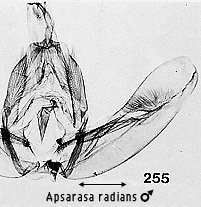 n.
Apsarasa radians Westwood; Holloway, 1976: 15; Barlow, 1982: 86. Diagnosis. The pattern of the forewings renders this species unmistakable. Taxonomic notes. Grunberg (1911) distinguished numerous taxa on the basis of minor differences in maculation. The male genitalia exhibit great constancy throughout the range of the genus. From the Moluccas eastwards the central white patch of the dorsum is broadened, and the patches along the basal two thirds of the costa are reduced; these forms are best referred to A. praslini Boisduval (= wallacei Moore, nigrocaerulea Hampson, atramenta Hampson, moluccana Grunberg). The Andaman race of radians, figurata Moore, shows some tendency towards praslini in fades. Geographical range. N.E. Himalaya, S.E. Asia, Andamans, Peninsular Malaysia, Sumatra, Borneo, Philippines, Sulawesi. Habitat preference. The species is perhaps most frequent in lowland forests but has been taken at 1000m on G. Mulu and 1200m on G. Kinabalu.